Preheat oven to 400°F. Toast 2 crusts in oven for 7–10 minutes, then cut into 1"x4" strips. In a microwave-proof bowl, mix together refried beans, cream cheese, taco seasoning and 1/2 cup of picante sauce. Microwave on high 2 minutes, stirring halfway. 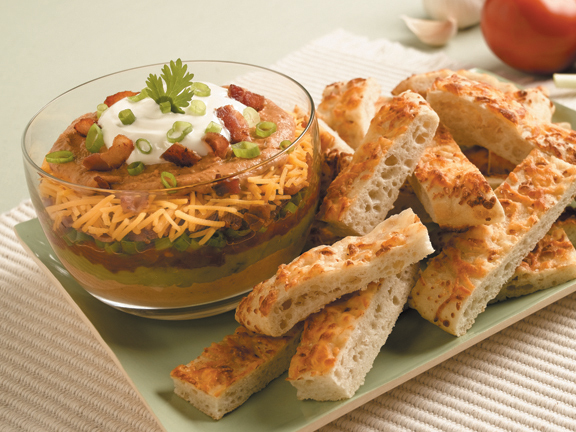 In a serving bowl, layer half of the bean mixture, guacamole, remaining picante sauce, green onion, bacon, cheese and remaining bean mixture. Top with garnish.